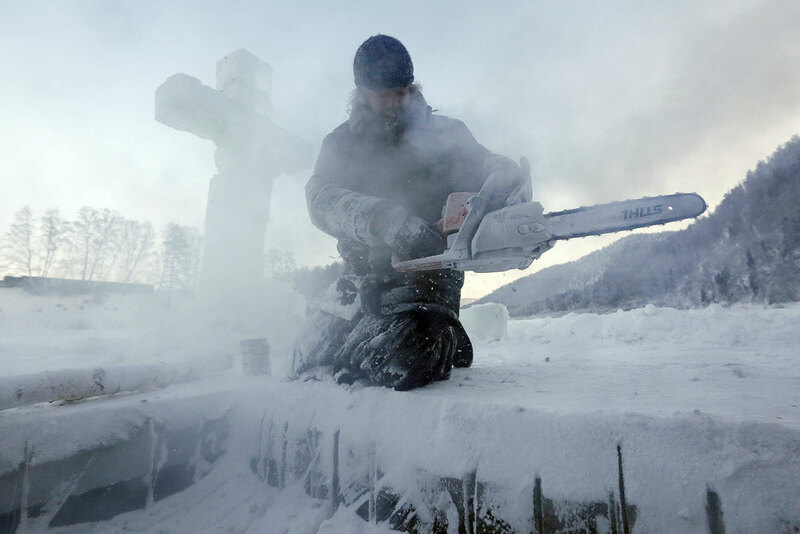 Hieromonch Nikandr from a local male skete operates a chainsaw while preparing an ice hole for the Orthodox Epiphany ceremony on the ice-covered Mana river, with the air temperature at about minus 30 degrees Celsius, in Taiga area near the Siberian village of Mansky outside Krasnoyarsk. Up to two million people took part in celebrations in Russia for the occasion of the Feast of the Baptism of Christ, the Interior Ministry's press center told Interfax. Some 45,000 police officers and soldiers were maintaining public order near churches and specially equipped Epiphany baths. Employees from private security firms, volunteers and Cossacks assisted them. As many as 89,000 people participated in the Epiphany bathing in Moscow, the press service of the Russian Emergency Situations Ministry's branch for the city told Interfax.